Collision investigators have finished documenting the scene of Friday's fatal bus crash at an Ottawa transit station, but it could still be a while before the public gets firm answers about what happened. 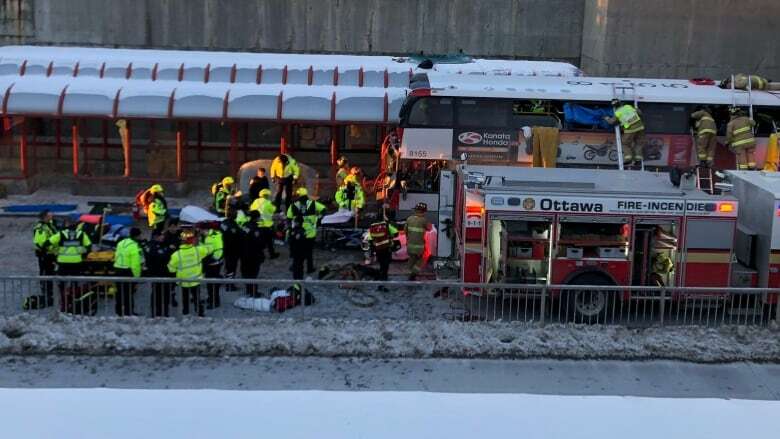 Three people died and 23 people were injured when a double-decker OC Transpo bus collided with the Westboro station at the start of rush hour. Here are just a few of the areas where significant questions remain, more than 36 hours after the deadly collision. It's unlikely investigators will be making any declarative statements about the cause of the crash for some time. At a Saturday press conference, Sgt. Cameron Graham with the Ottawa Police Service's collision investigation unit told reporters investigators were looking at a number of elements — including weather conditions, the bus itself, and "human factors." Later in the day, investigators drove a similar double-decker bus down the same stretch of the Transitway, the city's bus rapid transit network, hoping to get a sense for what conditions were like at the time of the crash. Both Graham and police Chief Charles Bordeleau, however, have said the investigation will be complex. Transport Canada and Ontario's Ministry of Transportation are also investigating. Three people have been confirmed dead, but Ottawa police have not released their names or any other information. In fact, one of the only details to have come out is that some members of the Canadian Armed Forces were among those injured. Angela Banville, commandant of the Canadian Forces Support Unit, told CBC News Saturday that an unspecified number of "defence team" members were hurt and that they would be "made aware of all the support available to them." And while it's possible the number of fatalities could rise, it won't likely rise by much. 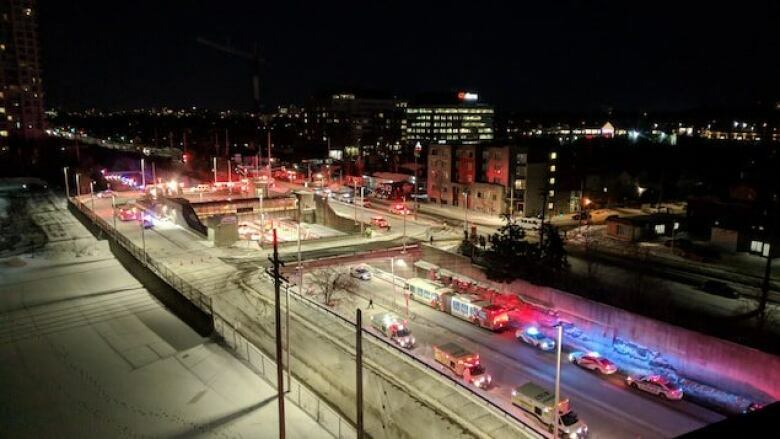 While the Ottawa Hospital was reporting Friday night as many as nine people in the hospital were in critical condition, less than 24 hours later only one patient still required critical care. The Queensway Carleton Hospital also handled a number of patients, but in the end, only one person was admitted — and that person's condition was serious but stable. For some people, Friday's crash no doubt brought to mind another Ottawa mass transit tragedy: the 2013 crash between a double-decker bus and a Via Rail train that killed six people. The Transportation Safety Board of Canada found the design of the double-decker provided riders little protection in that crash. After Friday's collision, some people were wondering if both the buses and Westboro station itself — which predates the addition of double-deckers to the city's fleet — may have contributed to the collision's severity. So will that lead OC Transpo riders to hesitate before stepping on board a city bus? Or a light rail train, when Ottawa's Confederation line eventually opens? It's hard to say. While city officials maintain the mass transit network is safe, others are calling for double-decker buses to be taken off the Transitway for the time being. Mayor Jim Watson's declaration Friday night that flags at Ottawa City Hall would be lowered to half-mast was an immediate recognition of the crash's impact on the city's collective psyche. In fact, a number of residents felt compelled to stop by the crash site Saturday morning. Two men even set up a tree as a memorial, noting they wanted to affix the names of the crash victims to its branches. The Distress Centre of Ottawa and Region also brought in additional volunteers to help people cope with their anxiety and grief. "It's just an awful thing for us as a whole community, as a city, to go through," said Inge Roosendaal, a regular OC Transpo rider. As of Monday, people will be able to sign a book of condolences for the crash victims at Ottawa City Hall. The book will be available until Sunday, Jan. 20.